See progress from the Guardians' upcoming attraction at Walt Disney World. Future World at Walt Disney World’s Epcot is going to gain some new Guardians. Last week, 960 trucks’ worth of concrete was poured to create the foundation of what will soon take shape as Epcot’s mammoth “Guardians of the Galaxy”-themed attraction. The attraction is on track to become one of the world’s longest enclosed coasters, and to house it, a new facility is being built adjacent to the existing Universe of Energy building. 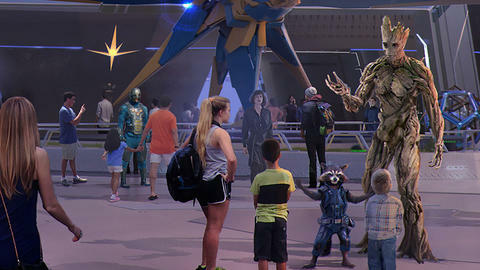 Inspired by the films from Marvel Studios, the “Guardians of the Galaxy”-themed attraction will expand on the original vision of Epcot’s Future World, with an epic storyline being developed by Walt Disney Imagineering in close collaboration with the original filmmakers. Take a behind-the-scenes look in the video above at the construction progress!